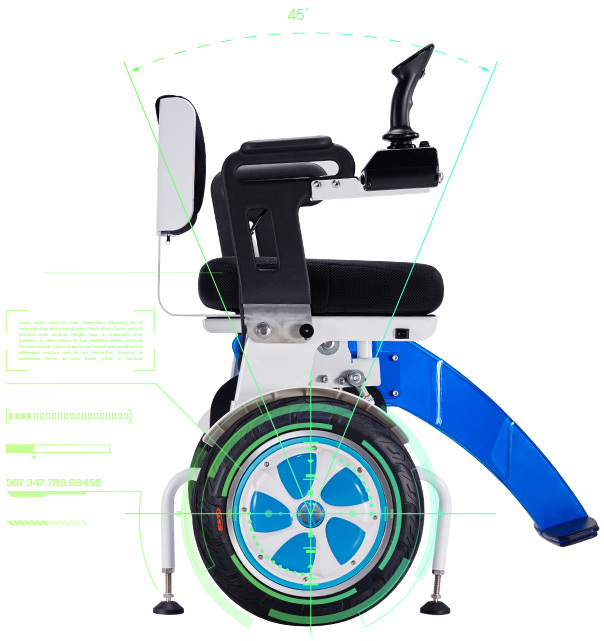 Abstract: Display your unwavering support for alternative energy, the environment, and sustainability with intelligent robots like the Airwheel A6S smart electric wheelchair. It is a guardian for the natural environment as well as a convenient personal transport for the masses. Smart technology allows everyone in your family to ride. As an alternative, Airwheel A6S power chair serves as a guardian for the natural environment as well as a convenient personal transport. Now, we are filled with traffic jam and environment pollution and such situation is in dire need of green and convenient vehicles. Airwheel A6S, powered by green electricity will be your next transport. The family vacation is getting more environmentally friendly. "It's a balancing act!" The eco-friendly A6S challenges society to think smarter and more efficiently. A6S self-balance personal transport installs gyro system to allow riders to control it via change of gravity centre. Riders can lean forward or backward to go forward or backward. You must have noticed that there is a joystick controller via which riders control directions. The controller can be mounted either on the left side or on right side to meet all riders' riding habits. A6S is suitable for many different age groups and they can ride it to walk dog, go shopping, do exercise and play stunts etc. In addition to the recreational purpose, its practical purpose is also worth noting. It becomes an alternative to our personal transport. As an alternative, Airwheel A6S lightweight balance wheelchair has its own features. It adopts automatic kickstands, which enables it to be easily parked anywhere. Previous：Why does someone choose Airwheel H3S motorized chair over its competitors?